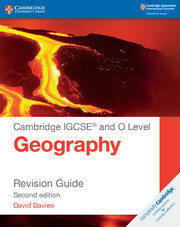 Cambridge IGCSE and O Level Geography has been written specifically for Cambridge International syllabuses 0460 and 2217. Filled with sources, graphs and case studies, the coursebook requires students to examine a range of information, helping to build their analytical skills. Written by highly experienced authors and Cambridge trainers, this coursebook is updated to support both Cambridge IGCSE and O Level students. It includes clear and practical support, case studies from 25 different countries, fieldwork ideas and a range of interesting content. The accompanying CD-ROM contains support sheets for the topics covered, outline maps and sample exam-style questions. Answers to the activities are in the teacher's resource. 50 up-to-date case studies from 25 countries, including many with Cambridge International centres. A range of attractive content, including over 400 illustrations, helps capture and keep students’ imagination. Each spread of the book amounts to one lesson, making content easy to follow because information is all in one place. Fieldwork ideas for theoretical and practical use. 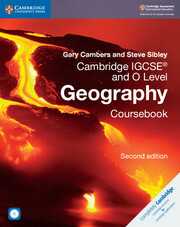 Full coverage of the Cambridge IGCSE and O Level Geography syllabuses. 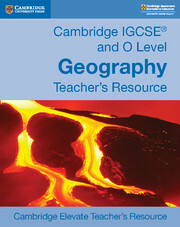 The accompanying CD-ROM contains over 40 support sheets for use with topics in the coursebook, and over 30 sample exam-style questions on geographical themes with marking schemes.